St. Vincent de Paul of Waukesha County is a group of lay Catholic volunteers from all walks of life- neighbors helping neighbors right here in Wankesha County. Assistance may include emergency rent, utilities, food, clothing, household goods and/or referral services. On a person-to-person basis, through a Home Visit, members offer help, hope, and encouragement to people in need- an ear to listen, a hand in a time of crisis and a hope to guide people toward programs that can bring lasting change to into their lives. 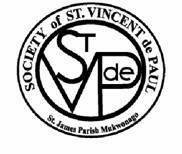 The St. James Mukwonago SVDP conference is supported through donations by Parishioners via the Poor Boxes located at the main entrance of the church and in the Commons. Our Conference has a food pantry of non-perishable goods that can be accessed by appointment. Food donations are always welcome in the bin outside the pantry door located in the Commons. 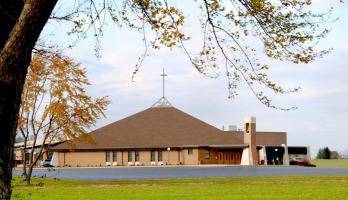 • Food baskets to needy families at Easter and Thanksgiving. We distribute approximately 50 food baskets to individuals and families in our local area. The baskets include a ham for Easter and a turkey at Thanksgiving. A food drive is held in the weeks prior to filling the baskets. • Priceless Gift Trees- Christmas trees containing tags with gift requests from young and old alike. Parishioners are asked to take a tag (or two), purchase the gift and return it under the tree. •Waukesha County Summer Lunch Program where our Conference prepares and serves lunches for one week during the summer for children who would not get their lunch or a meal at all during the summer if not for this program. Approximately 150 lunches per day are provided.